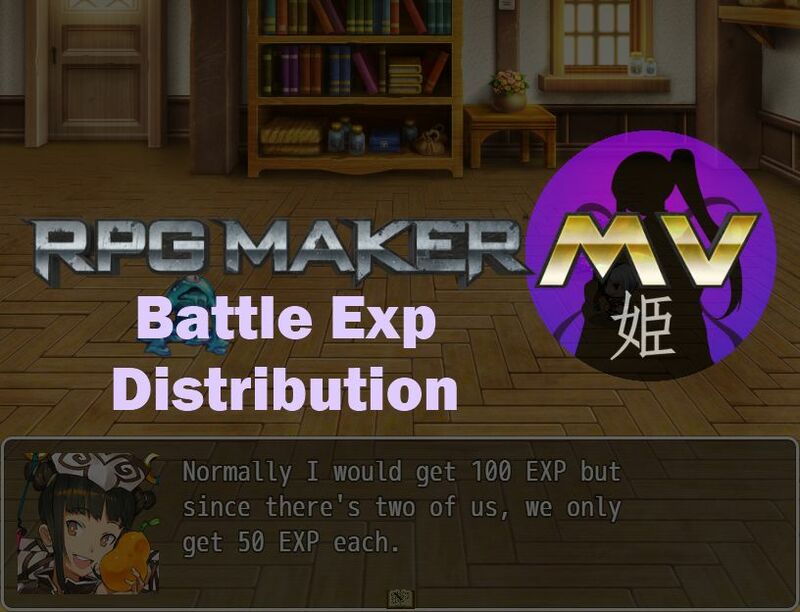 In RPG Maker, when you defeat enemies in battle, everyone that’s alive will receive some EXP. So for example, if you defeated a slime, and the slime is worth 100 EXP, then every party member that is alive will receive 100 EXP. If you had one member, that member would receive 100 EXP. If you had four members, then all four members would receive 100 EXP. However, this means there is no incentive to try to challenge yourself to have one party member solo the battle, because there’s no difference whether you bring your entire party or not. This plugin changes the way EXP is rewarded. Instead of simply giving everyone the same amount of EXP, the total EXP is divided among all of the party members. For now, the EXP is divided equally, so if an enemy gives 100 EXP and you bring three other party members with you, then everyone will only receive 25. However, if you decided to solo the enemy yourself, you will get the full 100. This plugin is for MV only. For RMVX Ace version, click here. Download ths plugin and place it in the “plugins” folder in your project’s “js” folder. Then open your Plugin Manager (F10), double-click an empty row, and select the HIME_BattleExpDistribution plugin. i would be interested in a plugin that affect how much % exp or so is given based on level difference. say a monster gives 100 exp when actor is low level 1 or 1-3 and say level 4 it only gives 80 exp instead? i know i could probly if i had few levels have several different same monsters give different exp and only make them face the actor based if level is enough instead of the other and only have actor reach like 10 levels at most but this kind of plugin would make things like 10x easier to manage everything and allows actor to level way higher..
Hime would u be interested in making a plugin like lv system of valkyrie profile game which in the menu u can distribute acumulated exp to whichever character u want. As it is provided, it simply takes the EXP and divides it among all members equally. Each member would then apply their own exp modifiers based on their traits and whatnot. There isn’t any functionality available to check “how many” members there are based on things like note-tags. I would like this in the VX Ace version. Can you do this with an identical/similar style in the previous engine?